To apply for a vacancy please visit our careers site and select the role you would like to apply for. Please read the details of the role carefully by downloading the job description and person specification. Click ‘apply’ and follow our online application form. You may need to attach further documents like a CV and covering letter or additional application form. Our online form may include mandatory questions marked with an asterisk, please ensure you answer these questions in order to progress. What employment checks do you make? Employment references – Any offer of appointment will be subject to receiving two satisfactory references from your previous employers. It is the Charity’s policy to approach your current or most recent employer for a reference after a job offer has been made. DBS (or PVG if you are located in Scotland) – due to the nature of some of our roles, you may be required to complete a disclosure check. What happens if I’ve had criminal convictions or cautions? We recognise the contribution that ex-offenders can make as employees and volunteers and welcome applications from them. A person’s criminal record will not, in itself, debar that person from being appointed to a post. Suitable applicants will not be refused posts because of offences which are not relevant to, and do not place them at or make them a risk in, the role for which they are applying. When will you contact my employment references? We will not contact your references until we have made a job offer. You will be asked to confirm the name of two referees that we will contact once you have returned your contract paperwork. The references you provide must be previous employers (one must be your current/most recent employer and not a relative). If this is your first job since leaving full-time education, your head-teacher or further education tutor can be given as a referee. If you currently work or have been working freelance or self-employed and are unable to give a previous employer reference please speak to us for an alternative route. Do you accept speculative enquiries/can I send my CV in for you to keep on file? Unfortunately, we do not accept speculative enquiries for jobs and we are unable to keep CVs on file. If there is not currently a vacancy you are interested in please sign up for our job alerts, so we can let you know when new roles have been posted. Can I apply for more than one role at any time? You are more than welcome to apply for more than one role at a time. Please note you will need to fill in an application form for each role you are interested in and you must ensure you tailor your applications for each role to demonstrate where you meet the criteria as detailed in the person specification as they are likely to be different. What is the latest time I can submit an application? Applications must be received by midnight on the closing date stated on the job advert. I’m afraid we are unable to accept applications after the deadline has closed. Our careers site is updated as soon as a vacancy is available, to keep up to date with our vacancies please sign up to our job alerts. I have applied for a vacancy and not heard anything, will I hear about the status of my application? The personal touch is one of Canine Partners’ values, therefore, we will contact all our candidates personally to let them know the outcome of their applications either way. Unfortunately, this is not always possible before scheduled interviews. Can I sign up to job alerts? Yes, please sign up for job alerts here. We have a limited number of work experience placements that we can offer throughout the year. Please see our work experience page for more information and requirements. I have a disability, is there any support offered during the recruitment process? 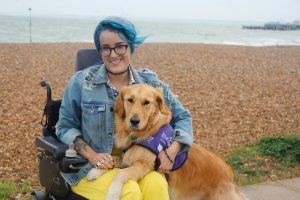 In 2018, Canine Partners became accredited as a Disability Confident Committed Employer under the Department of Work and Pensions (DWP) Disability Confident Scheme. Disability Confident is a government scheme that promotes the benefits to businesses of recruiting and retaining people with disabilities. The scheme offers advice and support to employers, enabling them to actively seek, hire and retain disabled people. Organisations’ complete a Disability Confident self-assessment, agree to undertake all of the core actions to be a Disability employer and offer at least one activity to attract and retain disabled staff. This means that, as an employer, we are positive about employing disabled people ensuring that people with disabilities and long-term health conditions feel supported, engaged and able to fulfil their potential in the workplace. We offer a guaranteed interview to disabled candidates who meet the essential criteria. If you require adjustments at interview stage please ensure you let us know when accepting the interview invitation. My application was unsuccessful, can I request feedback? Unfortunately, due to the volume of applications we receive, we are unable to give individual feedback at the application stage. However, we do provide feedback following an assessment centre or interview if requested. Please see our candidate privacy notice. I have received an email to say I was ‘unsuccessful’ before I was able to finish my application form. Why is this? For some of our roles, we have minimum criteria that you must meet in order to progress with your application. For example, the application form may use initial pre-application question pages to determine if you meet the minimum requirements of the vacancy. If you do not meet the minimum requirements of the vacancy, you will not be able to continue with your application. Any automated decisions will be highlighted to you in the application process and you will be required to agree that you are happy to proceed using this process. What are interviews at Canine Partners like? If you are shortlisted to interview we will contact you by phone or email, please ensure you keep an eye on both. We will let you know the format of your interview, this will depend on the role you have applied for. We may ask you to complete or prepare for a task in advance to your interview, this can be on or offline. For example, some of our roles may require you to prepare a presentation or to complete an assessment of your computer skills. Assessment centres – a variety of tasks both individually and in groups to assess skills like communication, teamwork and adaptability. They last approximately 3 hours. Formal interview – standard competency based interview, using questions to assess your abilities with example based answers. They last approximately 1 hour. At either stage, there may be a practical element depending on the role you have applied for. For example, dog handling for a dog trainer role or cooking for a housekeeping role. You will be informed of this before the interview. The interview is your opportunity to meet the team, see where you would be working and ask any questions about the role or working here. While an interview is still an interview, we want you to feel able to showcase your best self and enjoy the time you spend with us. We encourage you to leave your nerves at the door safe in the knowledge that there are no trick questions and that we are genuinely excited to meet people who are passionate about what we do. Please see our Why Work For Us page for some feedback from one of our employees about how they found our recruitment process. I’m interested in a role but I don’t live locally, what should I do? Some of our roles are location specific and you need to be located within commutable distance. If you would look to relocate for a role with us please detail this as part of your application. Can you pay expenses for travel/accommodation for interviews? We are delighted to receive applications from people across the country to work for us. However, we are unable to pay for candidates’ travel expenses so please keep this in mind before agreeing to attend an interview. We are based in Osgathorpe, Leicestershire and Heyshott, West Sussex. We are happy to give you recommendations for accommodation if you need to stay locally. Do you accept applications to work flexibly? We do try to consider flexible working where we can, our ability to accommodate requests is dependent on the type of role and workload. For example, some of our roles could be considered for job sharing. Please detail your requirement for flexible working as part of your application so that it can be fully considered. We receive lots of queries from people asking how they can gain experience to become a dog trainer and what qualifications we look for. Please see below a list of questions most frequently asked about our dog training roles. The role of a dog trainer is hugely varied and involves training dogs, instructing people, assisting with demos and fundraising as well as general administration. Trainers have 17 weeks with 4 dogs aged between 14 and 18 months, during this time the trainers will train, match and place their dogs with a disabled person (the partner). The training involves daily training trips to various towns and other areas in all weathers. We expect high standards in our basic obedience so attention to detail and consistency is a must. Later in the dogs training the assistance work such as retrieving items, opening and closing doors and help with other daily tasks is added in accordance with the dogs’ new partner’s needs. As a trainer, you will be responsible for identifying a suitable partner for your dog, which involves reading through application forms and meeting with the potential partner to conduct a matching visit. The trainers are then responsible for placing their dogs with their new partners on a 2-week residential course; this requires excellent communication skills and ability to instruct a variety of individuals with a range of physical disabilities. It is important to note that the role of a dog trainer is hugely diverse and includes working with partners, volunteers, members of the public and other members of the Charity’s staff as well as dogs. What past experience do I need? Although both practical hands-on experience and formal animal-related education are advantageous, a natural rapport and understanding of dogs is in some ways just as beneficial. More importantly though is a willingness to learn and adapt. Equally as important is the ability to instruct and teach people with disabilities either on a one to one basis or as a group. This is the most crucial part of this role and by far the most rewarding as well as the most challenging. How do I get the experience you are looking for? You might find a qualification in animal behaviour or other animal-related courses may help you gain practical experience. Some experience of working with people with physical disabilities would be particularly beneficial. You will need to instruct staff, volunteers, applicants or partners, therefore if you can show you have had experience in instructing or teaching people it could make you a strong candidate. Can you recommend any courses in dog training? We don’t recommend a specific course for dog training as we find choosing a course is a personal choice with many varying factors (price/location/availability) and you need to make sure the course objectives are a fit for your requirements. How do you choose your dog trainers? Once you have applied for a role we will go on to shortlist successful candidates to interview. When we shortlist, we use a person specification as part of the job description – we then base our shortlisting decisions on who meets the most criteria and can evidence this in the application form. If we have lots of people that meet all the essential criteria we may then look to shortlist those who also meet our desirable criteria. Whether or not you are shortlisted depends on the pool of candidates we receive. What if my question isn’t included here? Please submit your question to the recruitment@caninepartners.org.uk. We will answer your question as soon as possible and may add it to the FAQ to help future candidates.